Here at JCJ we accept the latest mainstream scientific evidence. Our climate is rapidly changing due to human-produced greenhouse emissions. We are facing an unprecedented crisis; it threatens the lives of billions of people and a potential mass extinction event. What we have seen. We have already observed increases in global average air and ocean temperature, widespread melting of snow and ice, and rising global sea levels. The extra heat in the climate system is affecting atmospheric and ocean circulation, causing a shift in weather, rainfall and wind patterns, and a change in the frequency and magnitude of extreme weather events such as flash floods, storm surges, fires, tropical cyclones and heavier monsoons. Carbon pollution is also driving ocean acidification, which is impacting drastically upon global marine ecosystems. 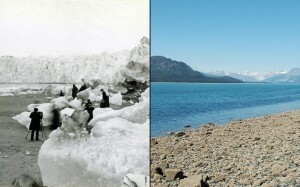 Muir Glacier melt 1880 to 2005. 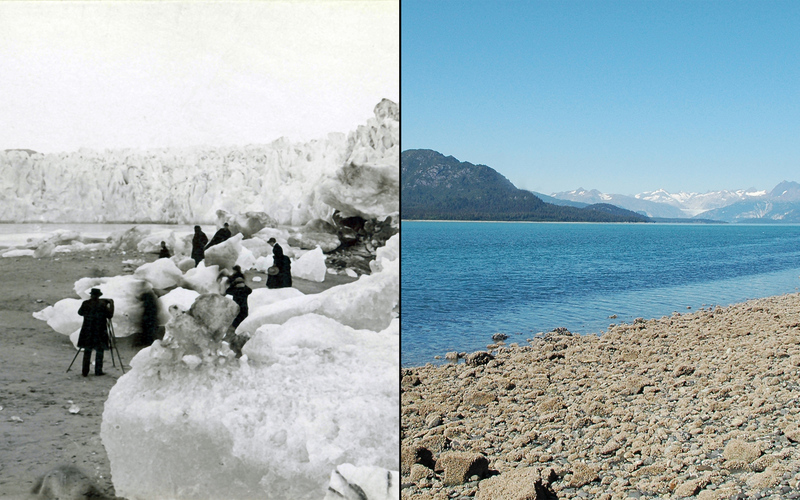 Courtesy of the Glacier Photograph Collection, National Snow and Ice Data Center/World Data Center for Glaciology. Consequences of inaction. Due to prolonged inaction, it now seems highly unlikely that we will be able to avoid 2°C of global warming, which is considered to be a ‘dangerous/extremely dangerous’ level of climate change. In fact, our current emissions trajectory puts us on track for up to 4°C of global warming by 2100, and potentially as early as 20601. It is vital that we act in every way possible to reduce our greenhouse emissions. We must also plan an effective adaptation response to minimise the impacts that climate change will have. Our planning and management must be effective to make the most of a bad situation. Effects in the Asia Pacific Region. Many communities will be drastically affected by climate change. They have limited capacity to adapt and cope. These vulnerable communities have contributed little to the climate crisis. It is driven largely by carbon intensive lifestyles in developed countries. There are many pressures on other countries to now catch up. People in developed countries have a social responsibility to reduce our greenhouse emissions AND support others in adapting to the climatic changes. This also applies to the wealthier people in developing countries. We should all ‘pay our dues’ for our carbon emissions, and empower the most vulnerable.